The Claddagh design is one of the most distinguished and original styles of jewelry given its symbolic importance both to Irish culture and to the history of the island and its people. 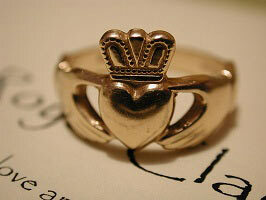 The most common question on the meaning of the Claddagh Ring design is regarding the usage of the heart with the crown on top as the central focal point with two clasping hands either side. These symbols each have their own special significance with the heart representing the qualities of love; the crown representing the attributes of loyalty and the hands expressing friendship. The decision on which hand and indeed on which finger should not be taken lightly as the positioning of the Claddagh Ring carries its own set of meanings towards the romantic availability of the wearer! According to tradition, when the ring is worn on the right hand with the heart facing outward (away from the body) this symbolises that the wearer is single and that their heart remains open to the prospect of love. 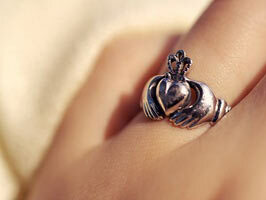 If worn on the right hand with the heart facing inward (toward the body) this symbolises that the wearer of the Claddagh ring is in a relationship and that their heart has been captured by someone. When a Claddagh Ring is worn on the ring finger of the left hand facing outward (away from the body) this symbolises that the wearer is engaged to be married. And if the ring is worn on the ring finger of the left hand facing inward (toward the body), this symbolises that the wearer is married.